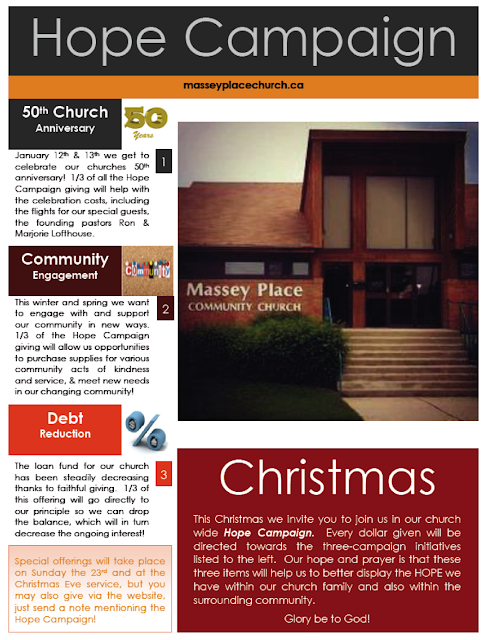 Massey Place Community Church: Christmas Opportunities! This Christmas we have many different things happening at the church - so come and join us for some, or all the activities! Our children will take all those old pesky pennies off your hands. They are collecting change (of all denominations :) and will get to use the money raised to send to families and children overseas! They will get to pick the projects it will all go towards! We are collecting mittens and socks for our local community school. They have a large need for both these items. Bring them into church, anytime. We will deliver them as they become get dropped off, so that those precious little ones can keep their hands and feet warm! December 21, Adult Christmas party - table games and dessert. We will gather together for an evening of table games and dessert:). If you have a favorite game, bring it along. A donation if you can- money will go to cover the evenings costs, anything above that will go toward the Christmas Hope Campaign. We are excited to celebrate with you! Please let us know that you can attend by Sunday Dec. 16th. Don't forget to invite your friends & neighbours! Our family Christmas eve service will be a wonderful celebration of Christmas. This service is open to everyone, and will include special candlelight songs at the end. We invite you to come as you are, and just enjoy some great traditional Christmas songs with your family (and ours) and focus on the hope we can have because of Jesus Christ. 6:30 pm at the church! Below is a flyer for the Christmas hope campaign. Find a pdf copy in the 'bulletin' section of the website. We really want to just encourage people to consider giving above their regular amounts to this campaign. It will be split three ways. For our 50th Celebrations January 12th and 13th. Also for a extra principle payment onto our loan. Then finally and definitely not least - for Community Engagement. We want to have some funds ready to encourage, support and engage our community. Perhaps for acts of service and kindness (help with graffiti or mowing laws, or garbage clean up) - we want to be also learn more about our changing neighbourhood and how we can best support them... the possibilities are endless! So - special offerings will be collected during the services on Sunday the 23rd and Christmas eve - but you are also able to give directly through the website - through pay pal or Canada helps!